May is Mental Health Awareness Month. Mental health is something I try to talk about openly and honestly as much as possible, both in real life and online. I’ve been dealing with depression and anxiety since I was in college, which equals about a third of my life. It can be exhausting, frustrating, and disheartening, but I don’t let my mental illness define me. The beautiful thing about being part of the online world is it’s easy to find people who share my struggles. Who understand. Who have been there or are there. Alternately, it can be hard for people who have never dealt with mental illness to truly understand what it’s like, but when you find people who are willing to listen and try hard not only to understand but also to help, encourage, and be someone you can lean on, it’s an incredible thing. I've been lucky to have many of those people in my life. 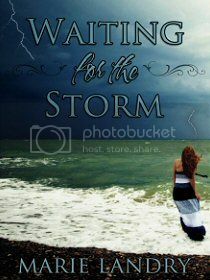 When I started writing my first Young Adult novel, Waiting for the Storm, I didn’t set out for it to be a book about mental health. In my mind, it was about grief and family. I was drowning in my own grief at the time after the death of my grandmother, and I needed an outlet. In many ways, Charlotte is me. All of my characters end up with at least some of my traits, but Charlotte is the most like me - her grief, her anxiety, that was me. Her love of U2: me. Her love of books: me. Her fear of open water: me. Big and small, she's me. Writing this book made me feel vulnerable. I cried through a lot of it. I felt like I was cutting myself open and bleeding all over the pages. Because of those things - because of the vulnerability and putting so much of myself into the story and the main character - writing Waiting for the Storm was an extremely cathartic experience. It kept me going during a very difficult time. Every person with mental illness or mental health issues experiences it differently. No two people will have the exact same experience with anxiety or depression or bi-polar or PTSD, etc. There is no universal experience. There will be relatable aspects, and it can be freeing and also comforting to discover there are people who go through the same thing and can truly understand what it’s like to feel as if your own brain is your worst enemy. It’s so important to talk about mental illness, and not just to show people they’re not alone, but also to help end the stigma associated with mental illness. To show people there’s no shame in seeking help. There’s no shame in being on medication or talking to a doctor or going to therapy. Remember: mental health is as important as physical health. Just like you take care of your physical health, you need to take care of your mental health, whether that’s practicing self-care, seeing a professional, or talking to a friend. You’re not alone. You don’t have to ‘suffer in silence’. Have you read any books that deal with mental illness? Have you been able to relate to a character because of their mental health issues? Can you recommend any books that deal with mental health or neurodiversity? Love the post today! I grew up with a mom who didn't give much credence to mental health. She's great, don't get me wrong, but her generation and upbringing just didn't believe in things like anxiety and depression. Because of that I am way too hard on myself and am constantly telling myself to just buck up and snap out of it. Luckily I have people in my life who've helped me see that depression and anxiety and panic attacks are not made up issues to get attention. I'm still learning to be kind to myself but just talking about it with others that get it helps. Another set of books that deal with this topic are the Ruby Oliver books. They're a bit silly and light hearted but the MC is dealing with panic attacks and some other issues too. I loved them! I will definitely check out the Ruby Oliver books - thank you!